My friend, Tina grew heaps of gorgeous pumpkins at her backyard and had a great harvest this year. Her husband just threw and sprinkled the pumpkin seeds that were removed from a pumpkin bought from supermarket. It took them by surprise that the plant grew rapidly and spread everywhere in their garden. Best of all, they didn’t put any effort or time to fertilize them. The fully-grown pumpkins were meaty, with golden orange, sweet flesh. Tina asked me to do her a favour to take one away as they were not able to eat all the them by themselves. How could anyone not accept this lovely favour? Heat vegetable oil and butter in a deep saucepan over medium heat. Add ginger and garlic, cook until aromatic. Add onion and saute until soft and translucent. Toss in the pumpkin and the sweet potato. Stir and combine very well. Cook for 3 to 5 minutes. Pour in chicken stock and bring it to a boil, covered. Reduce heat and simmer until all ingredients are soft. Turn off the heat. Let cool for a while. Use a blender to process all ingredients into a thick soup. Return to heat and warm it up again. Season with salt and pepper. To serve, add cream or milk if desired, with any bread to preference. How I wish I had fresh produce fresh from the garden. As fresh as it gets! I agree. Everything home grown always tastes better. I promise to try and keep up with my gardening in summer. I am so lazy! 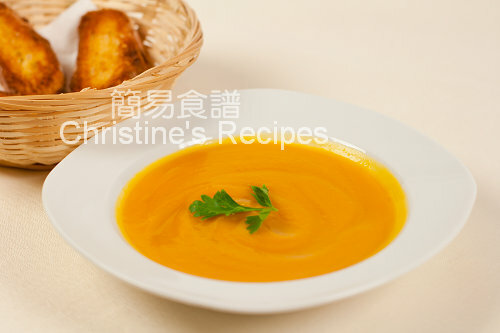 I heart your creamy soup, your garden-grown pumpkin which you receive it as a favor : ). Soup is a staple at our home. I have some butternut squash and will try this recipe. Nice photos too! So lucky! I wish I have a garden of yummy food too. Your soup looks so delicious. The texture seems so creamy and I love the ginger-garlic combination. You are so lucky to have a neighbor who shares. Your pumplin soup looked like it was pureed so well. The texture looks fantastic!! 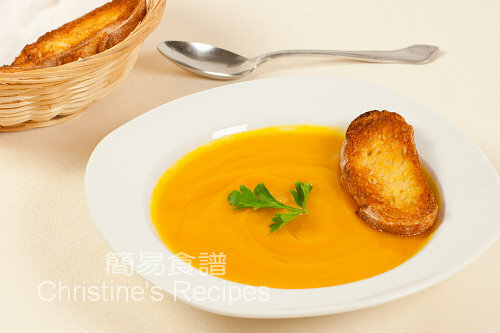 I love pumpkin soup and yours looks so mouthwatering. I usually use regular potatoes next time I will try your variation. Thanks for sharing. It's about 20 to 30 minutes. You can test it with a fork or chopstick. The pumpkin and sweet potato flesh should be very soft to the touch.